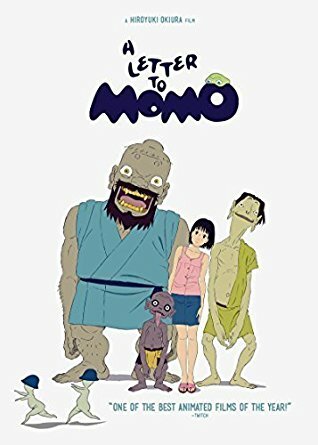 ‘A Letter to Momo’ is an animated movie from Production IG, directed by Hiroyuki Okiura. (120 mins). Young Momo’s mother returns to her native island in the Japanese Inland Sea after the sudden death of Momo’s father. Momo is upset because she argued with her father just before his disappearance. She carries the beginning of a letter to her that her father started but left unfinished. The story starts as family-centred but supernatural elements gradually intrude. Three greedy goblins have been assigned by Above to watch Momo and her mother. A fairly gentle comedy-drama develops. I liked this movie a lot. The human character designs are attractive, Momo is an appealing character, and the backgrounds are very detailed. This movie was released in 2011 but seems to have attracted little attention. The edition I bought is the UK Collector’s Edition, with BD+DVD in an attractive slip-cased box, with a booklet about the making of the movie.